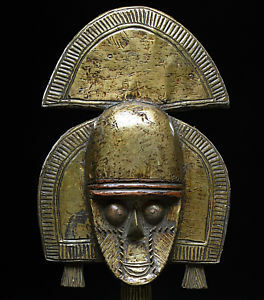 Types of Art: The Bangubangu carve freestanding anthropomorphic sculptures, which are characterized by coffee bean shaped eyes and pointed beards. Women also produce high quality pots that are sold in the local markets for profit. History: The Bangubangu are now thought to have a shared history with other early hunters (pre-Bembe hunters) who passed through the region, including the Bembe, Boyo, northern Hemba, and Holoholo. All of these peoples share similar carving styles that venerate the ancestors. They originated in the southeast around the Lualaba River and migrated in several waves to their current location near Lake Tanganyika. Like the Hemba, they have also been greatly influenced by their contact with the Luba. During the 19th century they cooperated with Moslem slave traders from the eastern coast and helped to establish a trading post at Kabambare. The population has been seriously reduced due to wars, slavery, and sickness, resulting in very few surviving examples of Bangubangu sculpture. Economy: Although descended from early hunters, very little hunting is currently carried out by the Bangubangu. They are primarily subsistence farmers, with the women employing slash and burn technology to raise maize, beans, millet, sweet potatoes, peanuts, and rice. Men contribute to the local economy by raising goats, sheep, chicken, and cows. Historically, the people in this region sold rubber, palm oil, and cotton on the international market. Political Systems: The current power structure in Bangubangu villages was imposed by the Belgian colonials and consists of a paramount chief, who is assisted in governing by several officials. Many villages do not recognize his power and pay allegiance to leadership selected on the local level. Village leaders are known as Sultani, a word which is obviously of Arabic origin. Extended families claim ownership to land, and inheritance is matrilineal. Religion: The Bangubangu recognize a supreme god (Vilie Nambi), and religious worship is focused on the ancestors. Shrines are built to appease family spirits, and there is a strong belief in Mujimu spirits who serve as an intermediary between man and god. Strong Islamic influence is also seen in the region, particularly in fear of malevolent spirits (djinns), who must be appeased. Within Bangubangu communities, diviners, blacksmiths, and waganga are invested with religious power.